Looks like the 2.25-mile, oval track in Polk County designed for high-speed travel in an urban environment will give the self-driving cars a challenging ride by using different types of roadways and events to test their reaction time. SunTrax is being built on a 400-acre site and is expected to take roughly two years to build out. It will have an urban core that reflects a typical downtown environment with parking garages, structures and pedestrians. The renderings also reveal ponds on the property for the testing of storm water systems and unmanned/automated watercraft.There’s even automated freight and container movement testing. 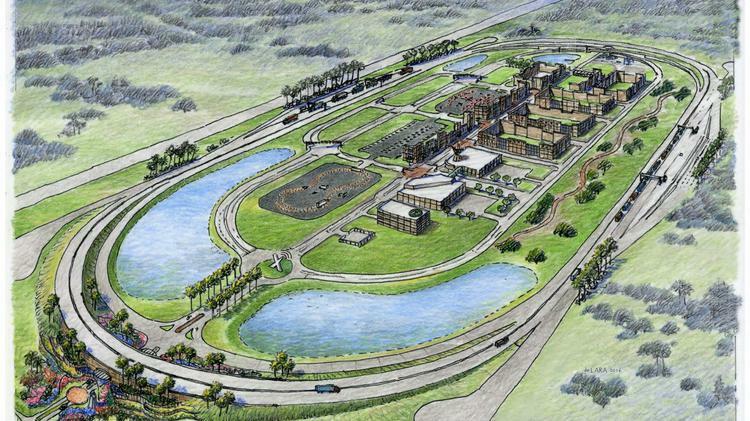 The construction of the SunTrax facility comes after Central Florida was chosen as one of the nation’s 10 premier clusters for the research and development of automated vehicle technology across all modes of travel this year. The competitive designation was awarded to the Central Florida Autonomous Vehicle Partnership that includes the Florida Department of Transportation’sFlorida Turnpike Enterprise and Florida Polytechnic University, NASA, the University of Central Florida, Florida Agricultural & Mechanical University, Lynx and others. SunTrax is expected to open in the first quarter of 2019. Meanwhile, take an interactive tour of the facility here.